Here is an incredibly effective pro-life tactic! Educate women who seek abortion. “It’s significant that we are seeing so many restrictions becoming law across the country, this isn’t just Texas,” said Nash. Let’s be clear. Nash is scared…. I am hopeful! Thank God!! The good news is that more than half of the country is “supportive” or “extremely supportive” (my words) to the rights of the unborn. Some of the victories include banning private insurance companies from covering the abortions, and restricting minors’ access to abortion without parental permission.Because, Duh! In 2000, only 31 percent of women in the country lived in states that are trying to protect the unborn. By 2014, that number reached 57 percent! That is huge!! Check out the progress in the middle of the country! Way to go Middle America!! 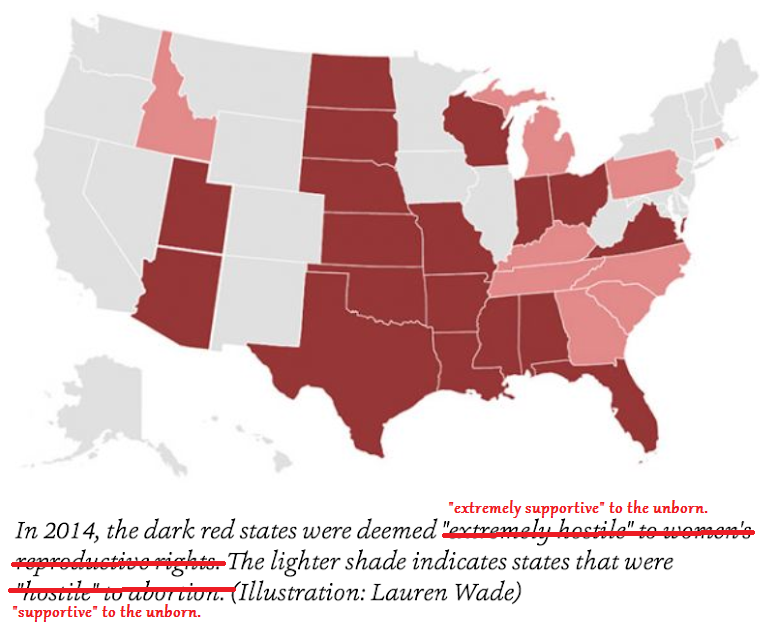 According to the report, the ENTIRE SOUTH is “supportive” (my words) to the unborn. 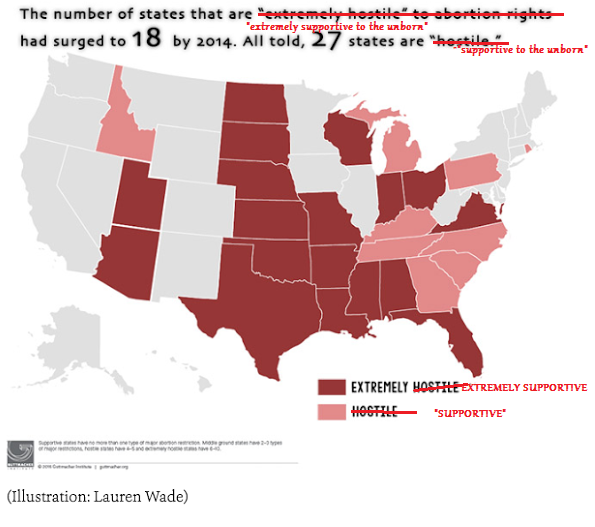 There is some bad news though: In 2014, there were only 26 abortion restrictions enacted across the country in comparison to the 70 that passed into law the year before, the report states. 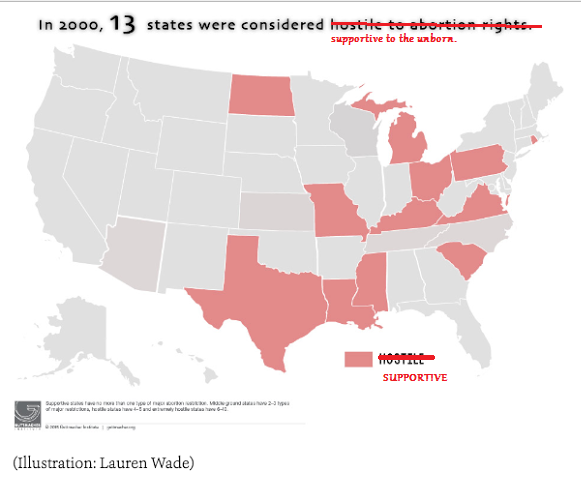 Pro-abortion advocates even scored a few wins with four states adopting laws to promote abortion rights and access. Long story short: the pro-life movement has made immense progress, no thanks to this guy. (Obama tells Planned Parenthood “let’s go on the offensive”) but there is still a lot of work to be done! So, in other words, what Nash is saying, in no uncertain terms, is that the future of unborn babies lives is up to voters. Amen to that! Those are their words!!! They know that it matters who you vote for! Everyone knows this! (well, everyone except a handful of really out-spoken trendy Christians bloggers, but don’t get me started.) If you don’t believe me still, here’s what one president did in 8 years. Bush. The truth is we don’t get a lot of positive news on FOX or CNN. But this, this is powerful information! This is good news! We did this! Your vote matters. And they are scared. Election season is around the corner. And the anniversary of Roe V. Wade is now. (side note: ever wonder the real story behind that case?? Click Here) Don’t let this week pass you by without praying, fasting, and seeking how YOU can make a difference! Yes, you can and should do more than just vote pro-life. But don’t let anyone tell you that voting isn’t a big deal. Thanks Haley Fox, a contributor to a newsy type website, for sharing all the info! It was the best news I got all day! You have a gift for making a point easy to understand and -well – logical. I had a disheartening conversation last night with someone I thought was “like minded” on basic issues. Turns out we are polar opposits on quite a few things. I see this person every Wednesday night because we volunteer together. How do you handle these situations?